Thomas was a farmer and was on the 1777 Northamptonshire Militia List for Passenham and Denshanger as being liable to serve in the militia. One of his children born in 1781 was another Thomas, also a farmer, and there is circumstantial evidence that he married Jemima. They went on to have three children, including in 1810 another Thomas. This Thomas was the first Benson to move to London to make their fortune as merchants, trading in muslin. 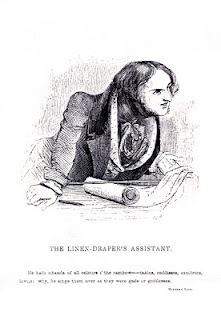 Nothing is known about his childhood, but we know that by the time of the 1841 census he was a linen draper living at 40 Upper Street in Islington. In October of the same year he married Mary COLE, a Worcester lass, the daughter of a carrier, in the Church of St Paul in Islington. Thomas and Mary went on to have three children, who were all born in Islington, over an eight year period between 1842 and 1850 : Mary (1842), Annie (1844) and William Cole (1850). Before the birth of their first child, they had moved to 3 Aboyne Cottages, Canonbury Park, Islington and Thomas had became a warehouseman. Business must have been going well because by the 1851 census they had three servants and Thomas was described as a commission agent. Ten years later, now 50 years old, they had moved to 15 Ravensbourne Park, Lewisham, still with three servants – a groom, a housemaid and a cook. Thomas was now described as an "importer of muslin - employing 3 men". Although Thomas was away from home at a hotel in Hastings on the 1871 census, the family had moved to Beckenham, Kent, and now had four servants - the housemaid and a cook plus a parlour maid and an elderly 86 year old coachman. In 1881 they were back in London living at 65 Elgin Street in Kensington with a housemaid and a cook. Sadly, Mary died of empleysema and dilation of the heart in October of that year, aged 62. After her death, Thomas must have retired to 10 Belsize Crescent in Hampstead where he became a "retired silk merchant" (1891 census). He died there in 1896 at the ripe old age of 85 of "senile decay". Probate shows his estate was worth a massive £24,780 (£2.24 million in today's terms using RPI as an index). He gave Charlotte Benson, the widow of Thomas John Benson (the son of his late sister Catherine Burnhill nee Benson) his freehold cottage in Denshanger. He gave three lots of £5,000 to his daughter, Mary (wife of Joseph Russell), his daughter, Annie (wife of Charles Washington Eves) and to Marion (wife of his son William Cole Benson). Also £2,500 went to both William Cole Benson and Joseph Russell. These were the bequests in his Will dated May 1890. However, in a Codicil dated just before his death in May 1896, Mary received his leasehold house at Park Road, Beckenham and Annie got his freehold house in Devonshire Street, Islington plus his two leasehold houses in Regents Park. He directed that his two leasehold houses, 15 and 17 Ball Street, Kensington, should be sold and proceeds held in trust for his son, William Cole Benson ....... who by this time was living somewhere in South Africa ! 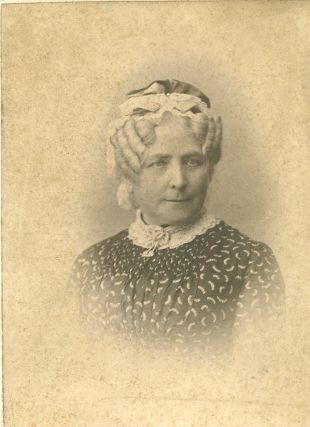 Their oldest child married Joseph Russell at the end of March 1865 and they had five children, one of whom was a Chartered Accountant (1891 census). Joseph was a foreign importer of silks and lace. They moved to the Hampstead area and lived in property in Finchley Road and the West End Lane and generally had a couple of live in servants. Both were still alive on the 1911 census. Annie, who was a "minor", being just under 21 and six months pregnant, married 26 year old Charles Washington Augero Eves two weeks after her sister Mary married. Joseph Russell, Mary's husband, was a witness, as had Annie and Charles been at Mary's wedding. They had at least six children although one died quite young. On the 1871 Census Charles is described as a "Colonial Merchant" and, in both 1881 and 1891, as a "West India Merchant". Charles was a prominent merchant based in London with extensive West Indian commercial interests. He represented Jamaica and, as an active member of the Royal Colonial Institute, wrote a manual for schoolchildren on the imperial history and geography of the West Indies (1889). He took a prominent part in promoting the Colonial Exhibition of 1886, for which he received the decoration of a Companion of the Order of St Michael and St George (CMG). They mainly lived in the Islington area which was where he died suddenly as a result of a fall down stairs into the basement while doing some DIY in 1899 (see The Times report of his inquest). After his death, Annie moved south to Hove, in Sussex, where she was living at 48 Ventnor Villas (seven rooms) on the 1911 census, with an unmarried daughter, a cook and a housemaid. His cousin, George Eves, together with a Henry Woodbridge, founded the Uxbridge Permanent Building Society in 1879. Their youngest child, and only son, was born in 1850 in Islington. In 1874 he married Marion Eliza JOHNSON (photo below right) who was one of five daughters of a Scottish surgeon, James JOHNSON. She was born in Milton, Gravesend in Kent and they were married in Redhill, Surrey. They must have been well off as they had five live-in servants at the time of their childrens birth – a groom, parlour maid, cook, nurse and monthly nurse. They lived at picturesque The Mount, Sparepenny Lane, Farningham, Kent between about 1874 and 1884. William was variously described as a “clerk in his father’s office”, a “merchant” and a “cotton merchant”. William a nd Marion had three surviving children including my Dad’s mother, Marjorie BENSON. They had at east two other children who died at birth. Shortly after Marjorie’s birth in Kensington in 1884 (St Georges Terrace, Kensington), William walked out on the young family and emigrated to South Africa. Both surviving son's, Alick Cole BENSON and Hugh BENSON have interesting stories. Presumably due to the separation, Marion and her young family moved from the manor house in Farningham to Fulham and in 1891 she was living with them at 53 Talgarth Road with her widowed mother, a cook and a parlour maid. However, by 1901, perhaps running short of funds, she and her eldest son Alick are found living without servants at 49 Kensington Hall Gardens in Fulham. She is described as "living on means". By the time of the 1911 census, Marion was visiting her sister in law Olivia Dethridge, Charles Washington Augero EVES' sister, at 123 Lansdowne Place, Hove. Uncle Tony's autobiography recalls : "After the move to Tunbridge Wells (in 1922) my grandmother no longer lived with us but was established in one of the many Private and Residential Hotels which flourished, or at least subsisted, in gently decaying gentility upon the patronage of old ladies of her kind." Marion died in 1929 aged 83 at 12 The Crescent, Barnes in Mortlake, with her son, Alick, in attendance. Probate was granted showing an estate of £1,223 which she left equally to her three children (£58,000 in today's terms using RPI). Having gone to South Africa around 1884, nothing much is known about William Cole BENSON after he left the UK. He died on 3rd March 1898 at Camperdown, Natal, aged just 47. Whether his sons saw him before he died is unknown. I have been unable to trace any shipping lists with their names or, indeed, passport applications. It is all a mystery ..... currently !